Langur is the general name given to numerous species of Asian monkeys belonging to the subfamily Colobinae. The term is often restricted to nearly two dozen species of leaf monkeys but is also applied to various other members of the subfamily. The Purple-faced Langur (Trachypithecus vetulus), also known as the Purple-faced leaf monkey, is a long-tailed arboreal monkey endemic to Sri Lanka. This folivorous species normally has a social system consisting of one resident adult male (Harem), 1-7 adult females and a varying amount of juveniles and infants. All male groups (bachelor) also exist, numbering from 2-14 individuals. The colour of their coat varies with the each subspecies, but is generally brownish-black on the body and limbs, whilst the facial whiskers range in colours, from white to pale brown and are directed backwards. Newborns, by contrast, possess a pale grey coat, with a brownish tinge on the crown, chest, arms and legs. The face is greyish-black, as opposed to purple as its name suggests. 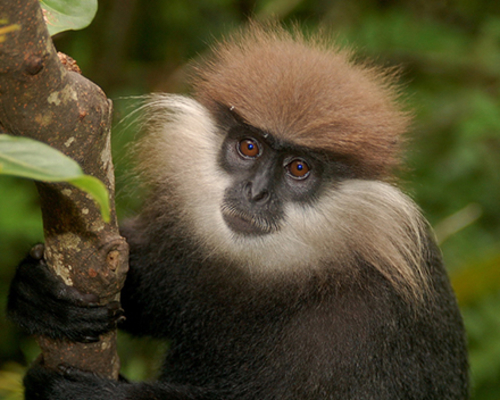 Trachypithecus vetulus vetulus:The overall coloration of this subspecies is gray-black with light-tipped hairs. The lumbar region, haunches, and the distal part of the tail are light brown with long creamy tips. The head and cheek whiskers are brown or gray-brown. Trachypithecus vetulus nestor:This subspecies is lighter and more gray-brown than Trachypithecus vetulus vetulus. The rump patch is silvery gray. The forearms and shanks are nearly black in color. The crown and nape are pale brown and the tail is slightly tufted at the tip. Trachypithecus vetulus philbricki:This subspecies is like Trachypithecus vetulus nestor except for having a less conspicuous rump patch. The lower parts of the limbs are black and the tail tip is pale, tawny to white, and not tufted. This species is the largest of the subspecies. Trachypithecus vetulus monticola:This subspecies has very thick, brown pelage. The cheek whiskers are long and white, hiding the ears. The tail is short on this subspecies. Trachypithecus vetulus harti:which is very much similar to Trachypithecus vetulaus v., but smaller in size, this species was noted to be a separate subspecies by P.E.P. Deraniyagala, however some scientist argue otherwise. The Purple-faced Langur is a folivorous species, but has also been known to eat fruit, flowers and seeds. This species prefers immature leaves because they are high in protein and low in lignin. Studies have shown that the fruits the Purple-faced langur preferred to eat tended to be fibrous and desiccated and are low in protein. Habitat varies with the subspecies, but they often inhabit areas near permanent water sources. Preferred habitats include tropical rainforest, dry evergreen forests and mature secondary, semi-deciduous and undisturbed cloud forests. Where natural forest has been lost, refugee populations occupy semi-urban and rural home gardens, rubber plantations and areas with adequate canopy cover. Purple-faced langur requires good canopy cover, but few forests currently exist within Sri Lanka that can support viable populations, and none of these are within protected areas. Furthermore, the human-modified areas that support much of the Langur population, such as gardens and rubber plantations, are under private ownership and therefore unstable, changing rapidly due to human population expansion and development.